We hated to leave Roatan Island but it was time. We had less than two weeks left on our visas and at the end of that time our family (and our car) had to be in either Mexico or Costa Rica. We were headed North towards Mexico. Our next stop was the town of Copan, Honduras. 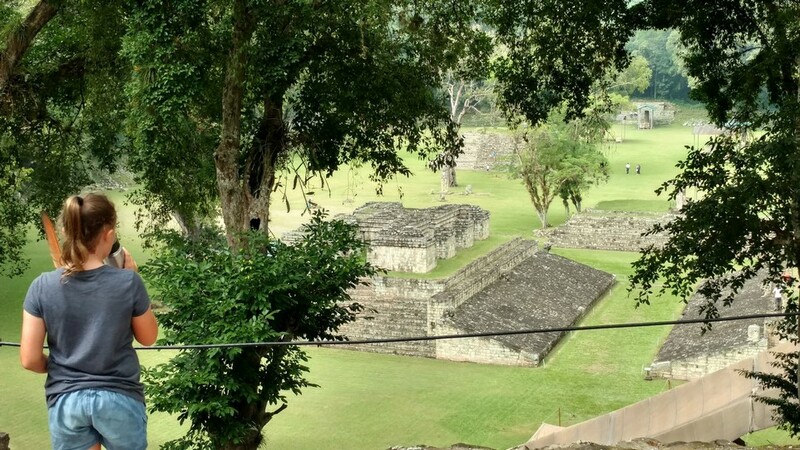 Technically the town is called Copán Ruinas which is aptly named because of the incredible Mayan ruins located a short walk from the center of town. 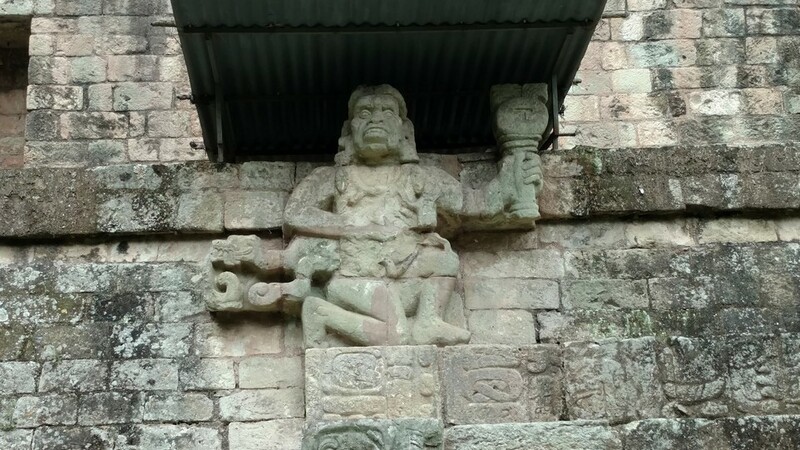 We had been looking forward to visiting Copan. We have friends there, and we had heard incredible things about the ruins. You can get to the ruins from the center of town via a 5 minute tuk-tuk ride or a 15 minute walk. We took a tuk-tuk there and walked back after our visit. When we arrived we were approached by a local guide and decided to hire him for our visit. His name was Raul and he was of Mayan decent. Raul, giving the family a brief overview of the ruins. The exact dates of occupancy are not known but most agree this site was founded somewhere around 200 BC but really began to flourish around 400 AD before becoming abandoned around 900 AD. The exact reason for the site becoming abandoned is not known (the most popular theories speculate a very big drought). 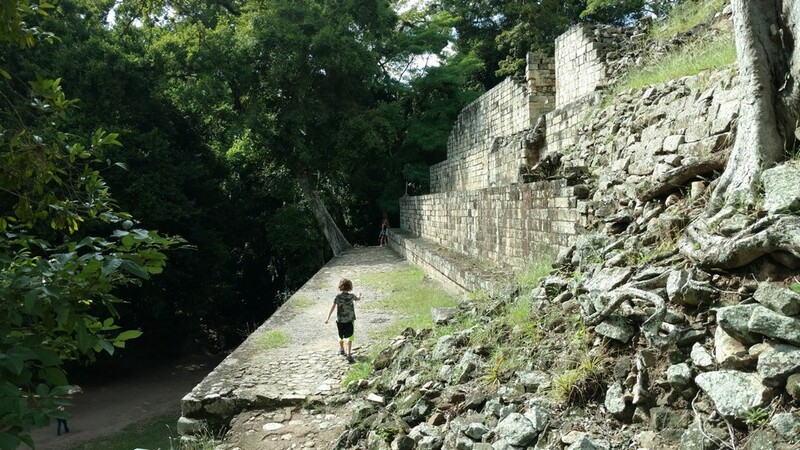 What is known with certainty is that this site housed Mayan citizens and rulers for well over 1,000 years. At its peak, over 20,000 people lived in what is now the Copán Ruinas and the surrounding valley. It was one of the most densely populated cities in the Maya world. 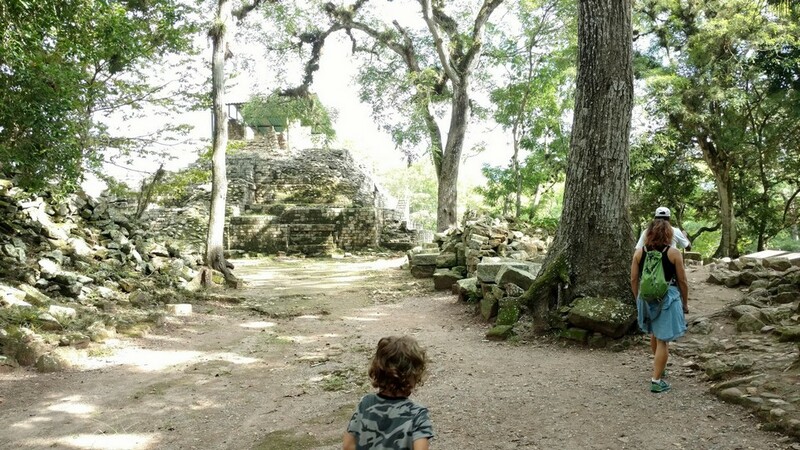 The site is abound with structures that were used in everyday life by the ancient Maya. There's a large acropolis, several plazas, a ball court that was used for an ancient sport, sacrificial and ceremonial altars, tunnels throughout several structures, and a vast amount of ancient residential houses. Some of the ruins have been impressively reclaimed from nature and many have not. We enjoyed, and were encouraged, to walk around and explore much of them. Just off of the main plaza is a temple that has a wide staircase with 63 stairs bearing more than 2,000 hieroglyphs. Together they comprise the longest known inscription of the ancient Maya world. Archaeologists are still trying to decipher some of these historic texts. 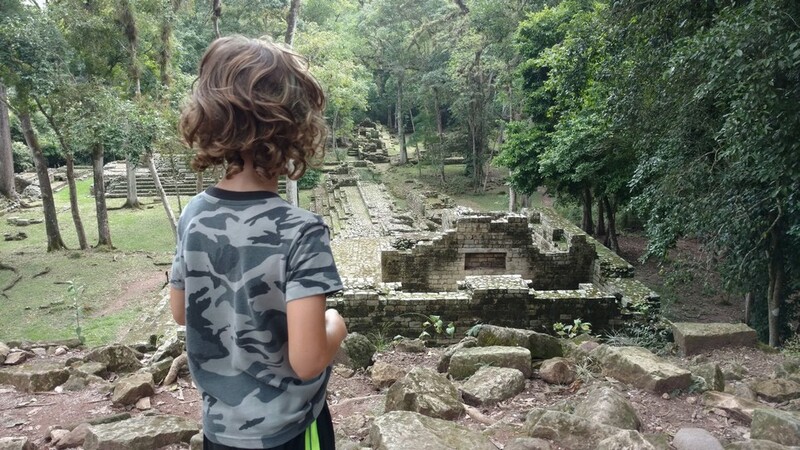 Here are some of our favorite photos we took while visiting the ruins. Many of the structures were impressively large. Many of the statues represent former kings of this land. The tour ended right by the feeding area for 20+ wild and thriving scarlet macaws that swooped down from their trees for feeding. Over a decade ago the government of Honduras donated two macaws to the ruins in hopes that, with proper care and oversight, they might once again thrive in the region as they did when the ruins were occupied in the ancient world. It's working! Each year the birds breed in specially constructed and managed areas, and each year hatchlings add to the growing population of macaws. Birds in flight. They were amazing to watch. Tag getting a closer look. Thankfully the birds are used to having people around. The beautiful birds are free to fly away but don't. Would you? They have safety in numbers, and are well fed in this amazing place. We spent about 2.5 hours in the park and even the kids enjoyed it (primarily because of the macaws).